We have 50 animals at Unity Farm - alpacas, llamas, chickens, guinea fowl, rabbits, cats, and livestock guardian dogs. Our "inputs" are second cut orchard grass hay, multi-grain chicken feed, a high protein game bird feed for the guineas, and various forms of kibble for the dogs and cats. Our output is compostable manure. 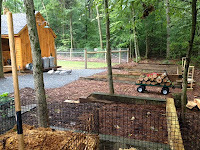 We created a 3 stage composting area and a mulch storage area, using compost bins made from lobster trap wire. 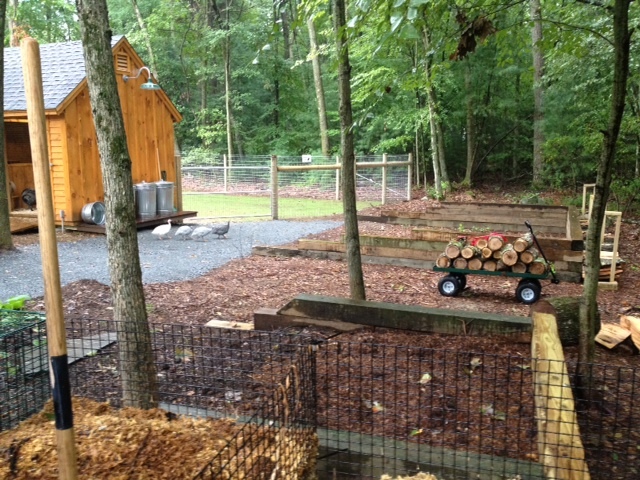 Every Tuesday we clean the coop and add the mixture of manure and wood shavings to the first compost bin. We add water to the bin so that mixture is moist but not soaked. "Llama beans" provide the nitrogen and hay/straw from the stalls provides the carbon. We moisten this mixture and turn it frequently. The management management area generates a fair amount of heat and with each new addition we mix the old and new, encouraging and active break down process. One side effect of all this manure management is flies. They congregate around manure piles and lay their eggs in the cooler edges of the compost. What have we done to manage flies? 1. Prevent them from laying eggs in the first place - keep the compost hot! With these three approaches, no flies bother our animals at all. Although Unity Farm is intended to be a sanctuary for animals and an orchard/blueberry patch, it's also a compost factory, which will ensure all our hay growing and fruit/vegetable growing is very productive. These are my favorite post... and I'm just waiting for the first blueprint of your farm. As a new farm owner (almost 3 weeks now), the ideas of where to start get out of hand quite frequently. I enjoy seeing what you are building. Ditto. I am loving the Thursday posts. I think we Healthcare IT folks must dream of a break from MU!